Find excerpts from books this page. Along 55,000 miles, the trail Damien drew an original route around the globe. At the time, in 1969, few sailing yachts had ventured to the Arctic, and few had run the Southern Ocean. None had wet under the Antarctic Circle. Damien therefore accumulated some “records” but the purpose of the trip focusing on personal achievement and not the feat, it is better to speak of “first” or opening new paths. The most original is the same boat, led by the same crew, has deployed a wide range of latitudes between 80 ° North and 68 ° South, with an incursion of 2000 km at the equator (rise of the Amazon ). The journey to Antarctica, the southern end of the third season in a row, after visits to many subantarctic islands then little known (South Georgia, Kerguelen, etc. ), was the speaker made the navigation of five years. Conducted with the means at hand, it must also be ressituée in the context of the time did not exist GPS, modern equipment on ships, those to keep out the cold or moisture, and food energy for conditions extrêmes.Parti La Rochelle May 25, 1969, Damien slowly up along the French coast before reaching London and Norway to Tromsoe.De, he sailed to Spitsbergen (August 1969). Its highest latitude was 79 ° 36 ‘before heading back south to Iceland, southern Greenland, where he could not discuss because of the ice. After having been capsized in the tail in a hurricane, the ship gained Newfoundland, Saint Pierre and Miquelon, Nova Scotia and New York. Borrowing inland, it is down the coast of the U.S. and crossed to the West Indies (end 69). Immobilized six months in the Virgin Islands after various hazards, Damien could sail to the French Guyana (August 1970) before starting the ascent of the Amazon. After the ice of the North, this rise of 2,000 kms up to Manaos formed the second main page of the epic. Christmas was celebrated in 1970 in Rio de Janeiro, where boat and crew prepared for their discovery of the southern seas. 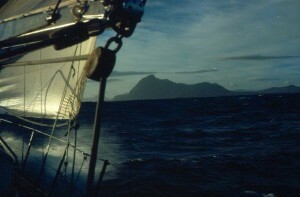 On 4 March 1971 Damien could pass Cape Horn from east to west in good conditions. But this exciting success for the crew paid a high price for three weeks in the vicinity of South Georgia, Southern island located 1,100 miles east of the Horn, by about 55 ° S. Caught in winds of 70-80 knots and a huge sea, Damien capsized three times, remaining keel in the air for several minutes. Her masts was devastated. 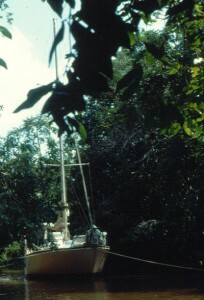 After a stop for repairs in South Georgia, the boat won South Africa (3000 miles of road) under jury rig. He prepared a new Southern campaign during a long layover in Capetown. Handing heading south in December 1971, Damien then visited the Crozet Islands, Kerguelen, Heard, Macquarie. But bad weather, ice, magnetic disturbances did cut short the attempt to reach the French sector of Antarctica, Adelie Land. Returning north to Tasmania, Australia, New Caledonia and across the entire Pacific against the trade winds (Fiji, Tonga, Cook) Damien touched Tahiti in October 1972. In January 1973, he made direct route from Tahiti to the Antarctic Peninsula (4.5 million) and touched Adelaide Island 37 days later. It was the first time a small sailing boat moored under the Antarctic Circle. The bad weather and ice were unfortunately not conducive to this polaireet campaign, after a visit to the South Shetland archipelago and a nice stop in South Georgia, boat and crew returned to civilization to Argentina (May 73) and Brazil. Looping the loop, Damien found La Rochelle in September 1973.